Humera is an innovator, a program director and consultant with over 20 years of experience in the private and non-profit sectors. In the last decade, she helped expand innovation and venture creation offerings in academia across the globe through advanced venture training workshops, competitions and other programs. Humera has led workshops and consulting services for corporate and university clients in the US, UK, India and Dubai. She has spoken on innovation in many venues, including SXSWedu, Oxford University, Aalto University, Michigan Tech, the American Society of Engineering Education. She has also delivered the plenary addresses at the annual conferences of the American Association of Colleges and VentureWell Open. 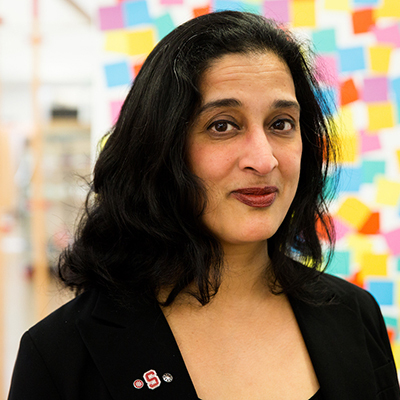 Humera is the founder of the University Innovation Fellows, a program she leads out of Stanford University’s Hasso Plattner Institute of Design, or the d.school. Founded in 2012, Humera has created a program with a user experience that empower students to become agents of change in higher education and to create new learning opportunities that will help their peers build creative confidence and hone their entrepreneurial mindsets. Working with these systems thinkers, schools are evolving their offerings in a way that prepares students to address the complex challenges in the economy of the future. Her work is the subject of social scientist researchers Bev and Etienne Wenger-Trayner in their soon-to-be-released book, Designing for Change: Using social learning to understand organizational transformation.